There is a pervasive sadness over this day, which has been come to be known as 12/14. 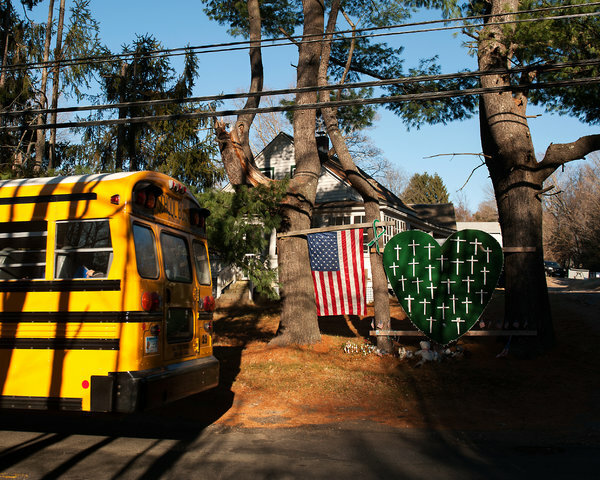 This is a day when, in Newtown, Connecticut, one year ago, 20 young children and 6 of their teachers and administrators were murdered by a deranged young man who had retreated to the four walls of his bedroom, covered his windows with black garbage bags, played violent video games–and despite this, his mother bought him guns and had already written out a check for a new gun for Christmas. According to a recently released police report, on the morning of 12/14/2012, this young man played a computer game called “School Shooting,” then picked up several real guns, shot his mother to death, and then went to a nearby school and killed twenty children and six teachers and administrators and changed the lives of their families forever. Whenever there is a school shooting, as there was yesterday in Colorado, people always say, I always thought it couldn’t happen here. But it does, and parents live with the knowledge that it is not impossible that our own children could be the victims of gun violence in a country where guns are so prevalent and virtually nothing is done to keep guns away from criminals and severely mentally ill people. It doesn’t have to be like this. There are very few mass shootings in Europe, and when there are, as at Dunblane, Scotland, and on a Norwegian island and in Oslo, things changed afterwards. After Dunblane, the British government outlawed handguns throughout the UK. After the slayings in Norway, where handgun laws are already extremely strict and the nationalized health system makes mental illness more easily treated, the Norwegian government has made it even more difficult to acquire handguns by raising the minimum age. “About 1,500 state gun bills have been introduced since the Newtown massacre. “178 passed at least one chamber of a state legislature. 109 have become law. “In the 12 months since the mass shooting at Sandy Hook Elementary School in Newtown, Conn., almost every state has enacted at least one new gun law. Nearly two-thirds of the new laws ease restrictions and expand the rights of gun owners. Most of those bills were approved in states controlled by Republicans. It would be wonderful not to have any anniversaries like today, but it doesn’t look as if that’s going to happen anytime in the future, as long as guns proliferate and criminals and clearly deranged people have easy access to them. I know what you’re trying to say, but I feel compelled to point out that “mentally ill” does NOT always equal “violent” and vice versa. I’m a social worker who is an advocate for mental health AND a person who lives with mental illness, and statements like this are very upsetting to individuals with mental illnesses who are thriving in their lives and in society and the people who work with them. Sorry, yes, you’re quite right of course. I’m going to change it to severely mentally ill, because 99.9999% of people with a mental illness don’t murder other people, particularly in a mass shooting. The NRA says that people, not guns, are the problem. I firmly believe that it’s the proliferation of guns that’s the problem. You just don’t see mass shootings in other first-world countries the way you do in the US. It’s one of the very few things that I never got used to, about living in the US. There’s such a strong logic that says that fewer guns = fewer gun deaths, and lots of evidence to prove it, but the US gun lobby remains so strong.